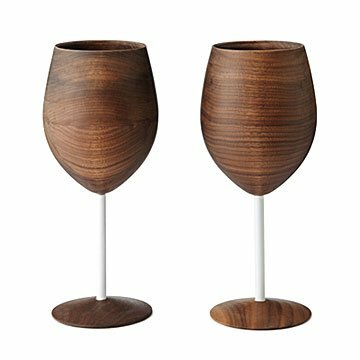 Sip on sweet chardonnay or enjoy an aged cabernet sauvignon with these beautiful wooden wine glasses crafted from gorgeous black walnut wood. Inspired by organic forms and contemporary American designs, maker David Rasmussen created these glasses with an iconic modern aesthetic. The pair makes a perfect gift for an eco-chic host or modern-minded newlyweds. Handmade in Colorado. Raised in New England, David Rasmussen grew up surrounded by the Northeast's rich furniture making culture. He learned about composition and construction techniques from masters in the field, focusing primarily on mid-century modern, Ming Dynasty, and contemporary American studio furniture. His unique experience led him to serve as the lead carpenter for Vermont's Forever Young Treehouses, creating handicap-accessible treehouses in Los Angeles, Chicago, Cincinnati, and Pennsylvania. Eventually, David returned to furniture design, bringing his understanding of the material's versatility to his organic designs for the home. Great quality and perfect gift! These wine glasses look great and suitable for everyday use. My wife uses these almost daily and they are holding up very well. I thought she would only pull the out when we entertain but they are her favorite. No taste imparted on the wine at all. She loves them and she doesn't have to clean up broken glass when she tips one over. Well worth the price. I bought these b/c they are unique, lovely and practical. I really love the wood carving. The only suggestion I would give would be to change the stem from a white plastic look to possibly metal or wood.. The white just distracts you from the beautiful wood work. I purchased these for my husband anniversary. He loved them and the wood enhances the flavor of the wine. i was disappointed in the fact that midway up the glass on both, it leaks. there is a small pin hole where if poured above that level, it leaks. we hand wash them, no soap but just have to make sure to never pour above the midway point. These wine glasses were purchased as a gift for my husband on our 5th wedding anniversary. We like to give traditional gifts and I had problems coming up with something made of wood until I saw these. They are great and my husband loved them! We enjoy using them and believe we'll use them often outside when the weather warms up. Cons: There is a slight odor but it went away quickly, and if I could redesign them, I'd do something other than the white plastic stem. Overall, the shape is great, it feels good in your hand and the wine tastes fine! This was my 5th anniversary gift to my husband and he loves them! We do traditional gifts, so this year's theme (wood) started to look very utilitarian (think: cutting boards) until I found these. They are beautiful, unique and such a cool gift idea! We love them and have gotten so many compliments on them, we decided to keep them out on display when not in use.